Strolling through the doors of The Ned for the first time can be awe-inspiring. It’s impossible not to be impressed by the beauty of the place and marvel at the scale of this hotel. The Ned is the latest outpost of the Soho House Group in London, and it’s located between the Bank of England and St Paul’s Cathedral. The SHG already runs 18 members’ clubs and 37 restaurants around the world, but the Ned (opened in partnership with Sydell Group) is a whole new ball game. While the SHG usually tends to open hotels in hip neighborhoods, the Ned is located in the City, the finance and business district—one of the most corporate parts of London. The Ned is simply spectacular: Spread across 320,000 square feet and 11 floors (three of which are underground), you will find 252 hotel bedrooms, a members’ club, six meeting and event spaces, three bars, indoor and rooftop swimming pools, a gym, spa, a barbershop, and steam room. Seven restaurants are open to the public, all located on the 32,000-square-foot ground-floor lobby. 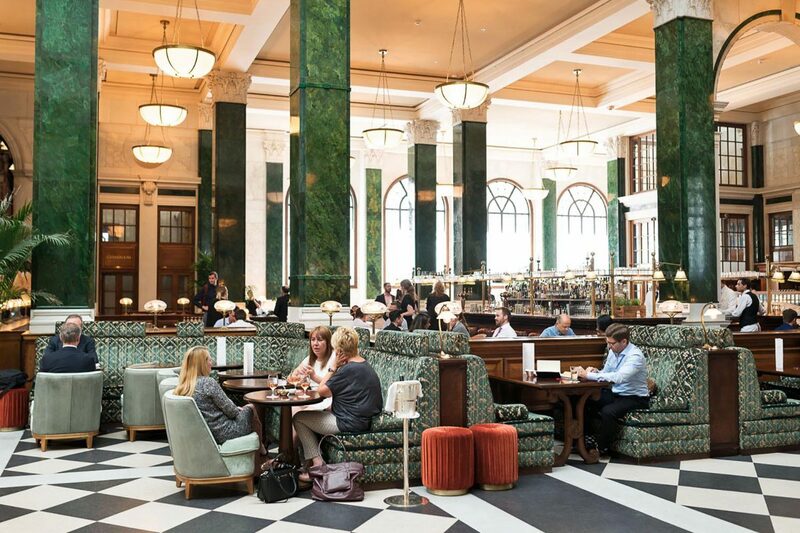 The Grand Banking Hall of the former Midland Bank still features some of the original 1920s design including massive ceiling skylights, rows of walnut-paneled banking counters and 92 columns covered in green verdite marble tiling. The hotel was named in honor of Sir Edwin “Ned” Lutyens, who designed this building in 1924. Walking into the Ned is like stepping into a parallel universe. The hall is imposing and grand, marvelous, and monumental. Spending time here can also be somewhat alienating, and can feel similar to being in a crowded train station, airport, or shopping mall. There may be as many as 1,000 people walking through the hall at any time when you consider that the restaurants cover up to 850 diners, plus hotel guests, club members, and Ned staff coming in and out. It may be anything but intimate, but it can also feel isolating. One of the restaurants at the Ned, Millie’s Lounge, is open 24 hours, so you can be there all day and lose track of time. In fact, you could probably spend a whole month at the Ned and never eat the same dish twice! The dining options are varied and range from Kaia, an Asian Pacific–inspired restaurant to Millie’s Lounge, serving classic British dishes; from Zobler’s Delicatessen, a traditional New York–style Jewish deli to Cecconi’s, an all-day Venetian brasserie. Malibu Kitchen is a cafe inspired by the healthy food menu of Soho House Malibu, while Cafe Sou is a Parisian-style cafe. The Nickel Bar is the place to go for drinks, but also for coffee and a small selection of hot dishes served throughout the day. Naturally, coffee is the reason we chose to visit the Ned. Daniel Thompson, head of coffee development at SHG, gave us a tour of the Ned and shared details about the Soho House coffee program, which he oversees globally. Thompson himself was involved in the development and design stages of the Ned, along with Global Creative Bar Manager Tom Kerr. He contributed to the design of the bars, product sourcing, planning of coffee events for Ned members, and barista training. There are eight dedicated baristas working within the Ned and one Coffee QC Manager, Gina Daubaraite, responsible for maintaining the quality standards. David Robson oversees the Ned as part of his remit as Coffee Operations Manager for Soho House UK. Members of the bar staff are also cross-trained in coffee to support the head baristas (they must complete two modules of the SCA Intermediate Program supplied by Origin Coffee Roasters). The objective is to ensure that quality and consistency are maintained across all of the Ned’s cafes. All the restaurants and bars at the Ned (and SHG in the UK) serve coffee roasted by Origin Coffee at their HQ in Cornwall, England. The partnership between Soho House Group and Origin started three years ago. The beans are a blend of three Brazilian coffees from two different farms. They are sourced especially for the Soho House Group and they change seasonally to maintain a consistent flavor profile. “We worked closely with Origin, creating a custom blend six months into our coffee program,” Thompson says. The first espresso I taste, prepared by Thompson at the bar at Malibu Kitchen, is nutty and sweet, with a good body and a little to no acidity. “We try to keep just ahead of the mass market, but also to push ahead and keep it interesting all the time,” Thompson explains. Thousands of customers walk through the Ned every week and Thompson’s job is to make sure that the coffee will please as many of them as possible. “Our members have a broad range of coffee tastes, from top end specialty to traditional Italian roast and everything in between,” he says. “So when it comes to our coffee, we tried to develop a blend that is progressive yet accessible.” The espresso machines are Linea PB by La Marzocco. Filter-coffee lovers can order the “house brew,” a batch-brew drip coffee made with ISB Bond Brewers. We have visited the Ned several times since our initial visit and both times we found the coffee to be consistently good (though we mostly visited Millie’s Lounge so far, so it’s difficult to express an opinion on the entire operation). The Ned is a very appealing place, especially the glamour and charm of the main hall, the Vault Bar, and the rooftop cafe (though the latter two are only open to members). It’s wonderful to have a place where you can sit in a corner for hours with a coffee while doing some work or meeting clients, having breakfast with friends or a drink with colleagues after work. It’s the kind of cool spot that was missing in the City, and that was badly needed. The Ned is located at 27 Poultry, London. Visit their official website and follow them on Facebook, Twitter, and Instagram.